The ugly side of tiny - and it's ugly. We try to hide it from the pictures and it shows up in brief clips on the videos. It’s ugly. It’s our STUFF. I used to always pride myself that I could pack my life into my car (besides my bed). When the process of “right sizing” began I was forced to acknowledge that somehow my belongs have multiplied. My packing disaster. I started with organization tips from books like Clutter Free with Kathi Lipp and The Magic Art of Tidying Up by Marie Kondo, but somehow I found myself standing in the middle of my piles of stuff throwing a 2-year-old like tantrum (honestly, what else can you do when your house looks like this (see above); stomp your feet and sit down and cry). I’d love to say that by the time “move-into the tiny house” day came I was organized and right-sized. 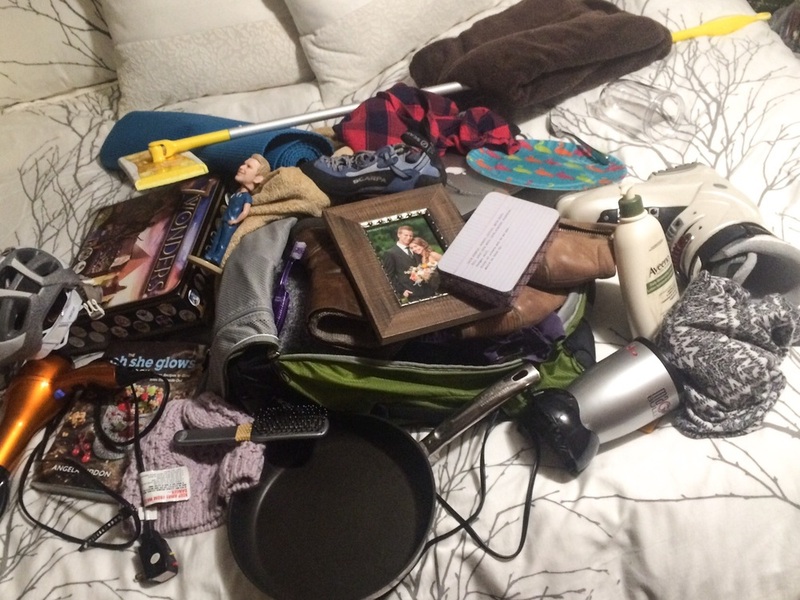 Unfortunately, even after hard work and long days my stuff had not disappeared. This sent my feeling defeated husband, Nathan, to rent a storage unit on the day we moved in. And the ugly continued. 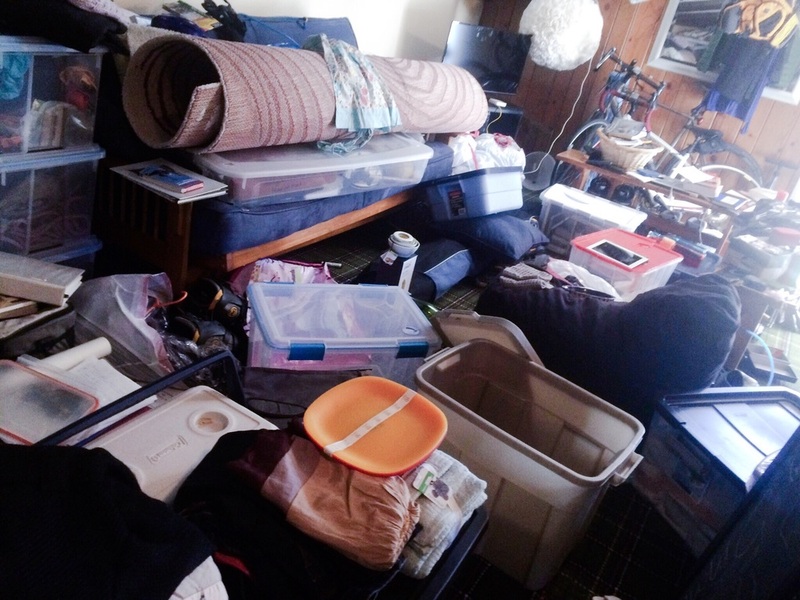 We made a conscious decision when we moved into the tiny house to only BRING IN STUFF WE USED. We didn’t want to let “the ugly” in the tiny house. I thought I could tackle the right-sizing process in a week. It turns out it's an everyday choice to only bring into the tiny house stuff that is used. Like when I go to the dentist and come back with the freebies, I have to make conscious decision to only bring in what I will use. The floss can’t come into the house because it will instantly become just clutter. Nathan and I have argued about stuff, struggled to understand why the other thinks something is important to keep, and been frustrated that right-sizing has taken so much of our “together time”. I’ve been working so hard to get rid of our stuff and I find that it just comes right back. Work gives you a free shirt, birthday presents come, and I want to buy something new. One has to teach oneself, family, and friends that stuff is not the focus, but experiences now replace times when we would have chosen or received stuff. And most importantly one has to ask “why” stuff comes into our lives.